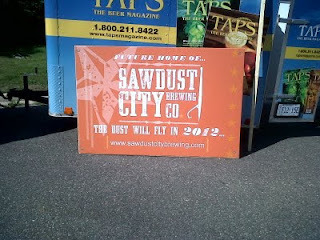 The August long weekend marked two more significant milestones for the Sawdust City Brewing Co. First, on Friday afternoon, we got our website up and running, you can find us hangin' out on our little pocket of cyberspace at www.sawdustcitybrewing.com . So next time you're out surfing the ol' world wide web, stop on by and say hello. There isn't much there yet, the site is still under construction, it's basically a glorified sign post on the side of the information super highway. But it's nice to look at and it will link you to our Facebook page and to this here blog. So check back every so often, we're hoping to have all the bells and whistles up in the near future. 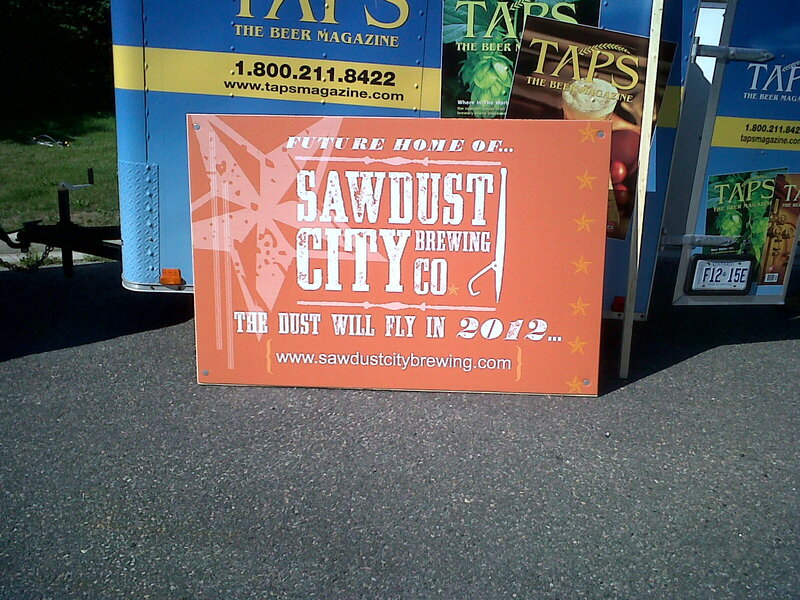 And here it is nicely propped up on our makeshift sign posts. Don't it look purdy? What isn't shown is Dave, Rob and Karla's kind friend. If he hadn't shown up to help us out and given us a few much needed pointers, we'd probably still be there trying to hammer in those danged stakes right now. It could have been a catastrophic waste of a beautiful long weekend in Muskoka, if not for him. Thank you Dave. Thank you. It proved to be a larger task than we first thought, but it in the end with a little help from our friends, it did get up and what better way to celebrate than with one of our own beers! 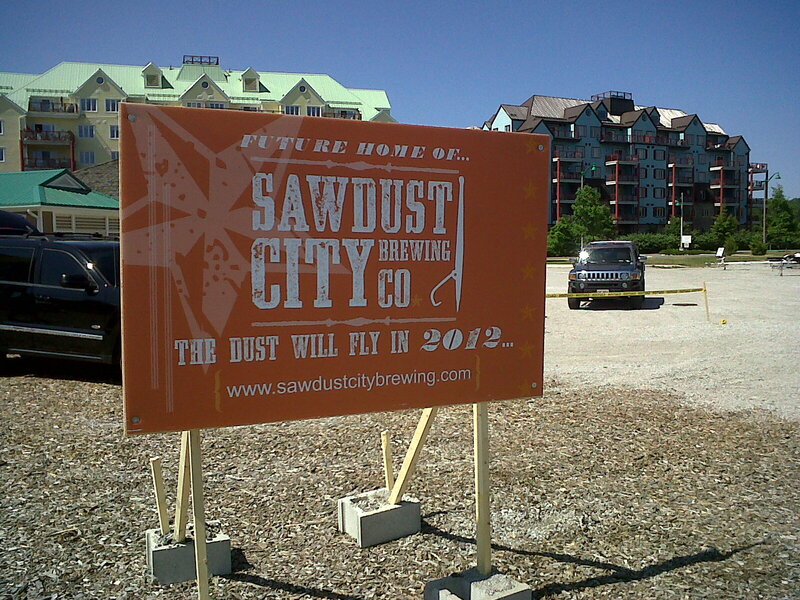 Rob and I christened the new sign with a toast of our Golden Beach Pale Wheat. Then for good measure, we opened another bottle and toasted again out on the dock. It's always better to toast more than once. I'm not sure what Emily Post would have to say about that, but frankly I couldn't care less. More beer is always better than less beer. Always. So there you have it, our digital sign post and our actual sign post are up and shinning for all to see. 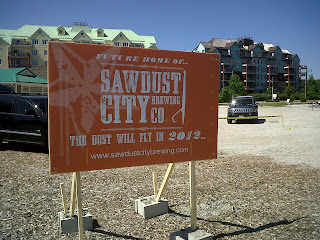 So stop by our site, either on the interwebs or down at the Muskoka Wharf and see what's new with the Sawdust City Brewing Co.